Last Thursday (16/08/2018) a few friends and I decided to do a recce of a walk around Glentornan Lough. We started close to the Gaelic pitch on the southwestern shore of Lough Nacung Upper, passed by Grogan Beg on our right and continued on to the summit of Crocknafarragh and continued on circling Glentrnan Lough keeping to the high ground to Crockglass and eventually down the western side of a stream in full spate to the south eastern end of Lough Nacung Upper and along the road/track to the Gaelic pitch. The weather was mixed, a couple of showers , a fair wind and a lot of sunshine. The views were magnificent and the cloudscapes fantastic. The first mile or so at the start and the descent at the end, another mile or so, were very challenging but the remaining five miles were great. 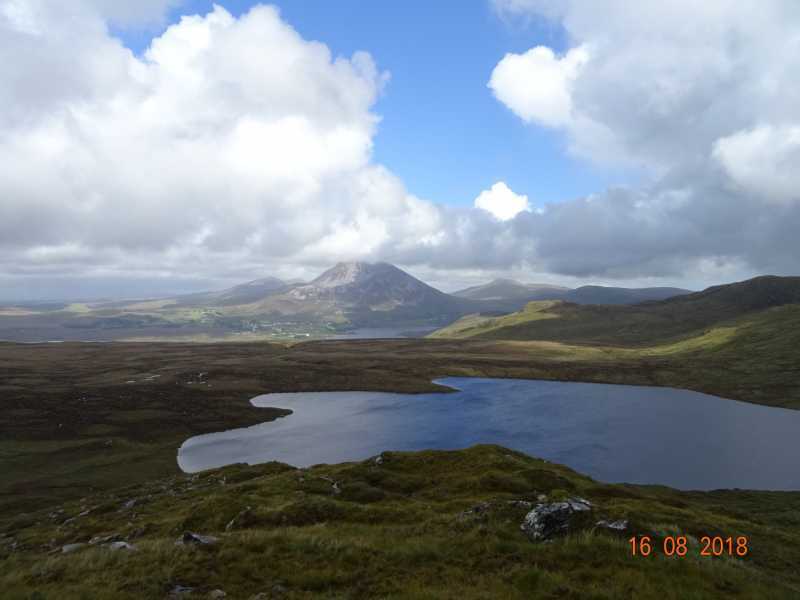 In my opinion the views on this walk are among the very best that Donegal has to offer.